Attribute names may be preceded by @ to distinguish them from elements or surrounding text, for example, the @props or the @class attribute. Element names may be delimited with angle brackets (< and >) to distinguish them from surrounding text, for example, the <keyword> and the <prolog> element. In general, the unqualified use of the term map or topic can be interpreted to mean "a <map> element and any specialization of a <map> element " or "a <topic> element or any specialization of a <topic> element." Normative information is the formal portion of the specification that describes the rules and requirements that make up the DITA standard and which must be followed. Non-normative information includes descriptions that provide background, examples, and other useful information that are not formal requirements or rules that must be followed. The terms non-normative and informative are used interchangeably. All information in the specification should be considered normative unless it is an example, an appendix, or is explicitly labeled as informative or non-normative. Appendices are always non-normative, unless explicitly stated otherwise. The DITA specification contains examples to help clarify or illustrate specific aspects of the specification. Because examples are specific rather than general, they may not illustrate all aspects or be the only way to accomplish or implement an aspect of the specification. Therefore all examples are non-normative, unless explicitly stated otherwise. A unique set of structural modules, domain modules, and constraint modules that taken together provide the XML element and attribute declarations that define the structure of DITA documents. DITA document types normally are implemented using DITA document-type shells. A set of DTD or XSD declarations that implement a DITA document type by using the rules and design patterns that are included in the DITA specification. A DITA document-type shell includes and configures one or more structural modules, zero or more domain modules, and zero or more constraint modules. With the exception of the optional declarations for the <dita> element and its attributes, DITA document-type shells do not declare any element or attribute types directly. An XML element instance whose type is a DITA element type. DITA elements must exhibit a @class attribute that has a value that conforms to the rules for specialization hierarchy specifications. A DITA element type is declared in exactly one vocabulary module. DITA element types may only exhibit attributes that are DITA attribute types. An element type that defines a set of relationships among topic instances. The map type provides the root element and, through the contained element types, the substructure for the map instances. The map substructure provides hierarchy, group, and matrix organization of references to topic instances. An element type that defines a complete unit of content. The topic type provides the root element for the topic and, through the contained element types, the substructure for the topic instances. The root element of the topic type is not necessarily the same as the root element of a document type; document types may nest multiple topic types and may also declare non-DITA wrapper elements as the root element for compatibility with other processes. The content model of a DITA element before specialization or the application of constraints or extensions. An element or attribute type that is not a specialization. All base types are defined by the DITA specification. Within a vocabulary module, an element type that can be extended, replaced, or constrained for use in a DITA document type. The process by which a specialized element is transformed into a less-specialized ancestor element or a specialized attribute is transformed into a less-specialized ancestor attribute. The original specialization-hierarchy information may be preserved in the generalized instance, thus allowing the original specialized type to be recreated from the generalized instance. Content models may be restricted through the use of constraint modules or through specialization. An extension that replaces an extension element with element types that are defined in an domain module, thus making the base type unavailable in the DITA document-type shell that configures the extension. (3) A process by which a generalized element is transformed into one of its more specialized element types or a generalized attribute is transformed into a more specialized attribute. The sequence of element or attribute types, from the most general to most specialized, from which a given element or attribute type is specialized. The specialization hierarchy for a DITA element is formally declared through its @class attribute. For a given DITA element type, the most specialized of its ancestors in its specialization hierarchy. An attribute type that is defined as a semantic refinement of another attribute type. The attribute type must be specialized from either the @base or @props attribute, and its range of permissible values must be a subset of or identical to the values allowed by the original attribute type. An element type that is defined as a semantic refinement of an existing element type. The content allowed by the specialized element type must be a subset of or identical to the content allowed by the original element type. Within a DITA document, all specialized element types must be refinements of one of the base element types, with the exception of elements that are used in the context of <foreign> or <unknown> elements. A domain module that defines exactly one specialization of either the @base or @props attribute. A set of declarations that imposes additional constraints onto the element or attribute types that are defined in a specific vocabulary module. A set of element types or an attribute type that supports a specific subject or functional area. Element types or attribute types in a domain can be integrated with topic types or map types to enhance semantic support for particular kinds of content. For example, the structural type <topic> declares the <keyword> element; when integrated with a domain for describing user interfaces, new keyword specializations (such as <wintitle>) become available wherever <keyword> was allowed in the original structural type. A domain module that defines one or more element types for use within maps or topics. A structural module that defines a single map type. A vocabulary module that defines exactly one top-level map type or topic type. Structural modules may also define specializations of elements from domain modules. A structural module that defines a single top-level topic type. A uniquely-named unit of element type or attribute type declaration. There are two types of vocabulary modules: structural modules and domain modules. For a given map type, topic type, or domain, there is exactly one vocabulary module that defines it. 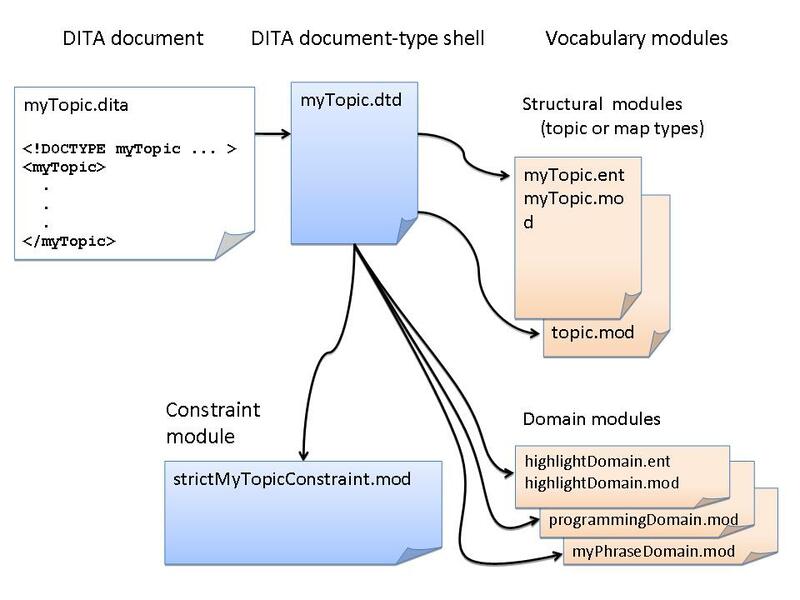 The following figure illustrates the relationship between a DITA document, its DITA document-type shell, and the various vocabulary modules that it uses. A <topicref> element or specialization of a <topicref> element that specifies the @keys attribute and defines one or more key names. The root map that establishes the context for resolving key references. For a given key-resolution instance, there is at most one root map that defines the effective value of the key space, as determined by the key definition precedence rules.. The effective set of unique key names that are defined by a given key resolution context. Within a given key resolution context, a key name has at most one binding. An element that is referenced by another DITA element. See also referencing element. The following code sample is from the installation-reuse.dita topic. The <step> element that it contains is a referenced element; other DITA topics reference the <step> element by using the @conref attribute. The following <step> element is a referencing element. It uses the @conref attribute to reference a <step> element in the installation-reuse.dita topic. An attribute, such as @conref, @conkeyref, @keyref, and @href, that specifies an address (a URI reference or a key reference).